Consult a food and wine pairing chart. If you're serving fish for a special dinner, you may be wondering, "What wine goes best with salmon?" While there are no longer many hard and fast rules about wine pairings, you'll find that certain bottles are more suited to this meal. Generally, the guidelines for choosing the right wine are fairly simple: fish and poultry go well with white wines, while beef and richer dishes go well with red wines. According to that logic, food and wine pairings shouldn't require a second thought, but of course, this isn't an exact science. Many things can affect your choice of wine, including side dishes, sauces, and variations in the main meal. The idea is to create a complementary balance of flavors, allowing both the food and wine to draw attention without overshadowing one another. With salmon, this balance can be difficult. A versatile and popular main course in both homes and restaurants, salmon isn't like other fish. It has a richer flavor, and it can overpower a light-bodied wine. It's important to choose a bottle that has strong and complex flavors of its own. Before you select your wine, give some thought to the rest of the meal. Food and wine pairing can be a little complex, and several factors can influence your choice. How are you preparing the salmon? Some cooking methods will change the flavor of the fish. Grilling, for instance, commonly adds a smoky flavor to the salmon. While this is a great way to prepare your dish, it may affect your choice of wine. A fuller bodied wine with notes of smoke and earth will pair well with grilled salmon. The same goes for sauces. Salmon can be wonderful with yogurt and dill, but the tartness of the yogurt may be better complemented with a slightly sweeter wine. If you use a maple syrup glaze on your salmon, you may not want such a sweet wine choice. Instead, choose a wine with citrus notes or a mineral character to cut through the sweetness of the glaze. Additionally, you may choose to serve uncooked salmon in the form of sashimi, gravlax, or another ethnic dish. Cooking the fish can dramatically change both its texture and flavor, so keep this in mind when choosing a wine. While the most important consideration for food-wine pairings is the main course, it's also a good idea to think about the side dishes. Salmon is great with many vegetables, as well as rice or potatoes. However, you should analyze how these side dishes might affect the flavor of your wine. Wine pairings are also a matter of personal preference. While a certain white wine may be best suited to your meal, you may prefer to drink red wines. Your taste preferences are just as important as any other factor. With a little research, you can find a wine you love that is perfect for your meal. Pinot Noir is a great choice if you love red wine. It's especially excellent with salmon prepared on the grill, and it can hold up to the strong flavor of this fish. 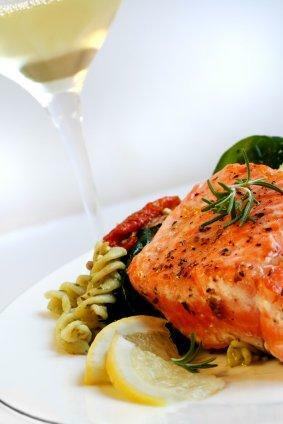 Pinot Grigio is wonderful with most seafood, including salmon. This light white wine is best with salmon that doesn't have a strong sauce, and it is excellent with acidic yogurt- or lemon-based sauces. Sauvignon Blanc is also a great white wine for lighter salmon dishes. It's important to choose a bottle that is not too fruity. Zinfandel is very good with blackened or grilled salmon. Look for a bottle that is somewhat fruity and not too dry. While there are several factors that can affect what wine goes best with salmon, you can't go wrong if you choose a bottle that stands up to the strong flavor of the fish without overpowering it.